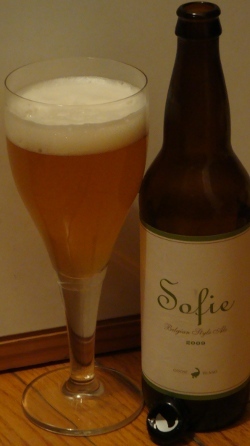 The beer style saison was originally brewed each winter in Belgian and French barns and farmhouses for the consumption the following summer by migrant farmhands. The Tourpes, Belgium farm on which Brasserie Dupont is located was one such place. They have brewed saison there continuously since 1844. In 1920 Alfred Dupont bought the farm-brewery for his son Louis. The brewery is now run by Olivier Dedeycker, great-grandnephew of Louis Dupont. They were among the first to brew organic beer, starting way back in 1990. 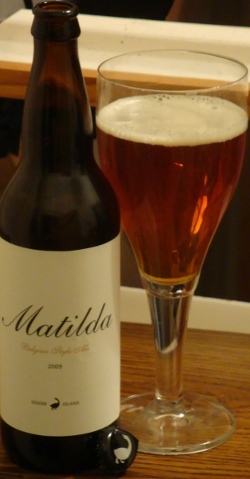 Besides making several varieties of saison and bier de miel (beer with honey), they produce the Moinette line of Belgian ales. Their website has some great pictures and plenty of details about their brewing procedures. If you can read French or stand bad Babelfish translations check it out. They also describe their baking and cheesemaking operations, if those tickle your fancy. Since saison is the beer Dupont is known for, tonight I will try three varieties. I’ll kick things off with two vintages of their flagship Saison Dupont, a 2007 and a 2009. I have a bottle of their organic saison called Forêt (Moinette Biologique in Europe). 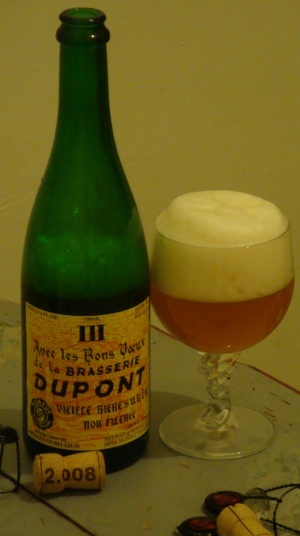 I will also taste a bottle of their holiday brew, Avec les bons Vœux de la brasserie Dupont (“with good wishes from the Dupont brewery”), usually shortened to just Bons Vœux. 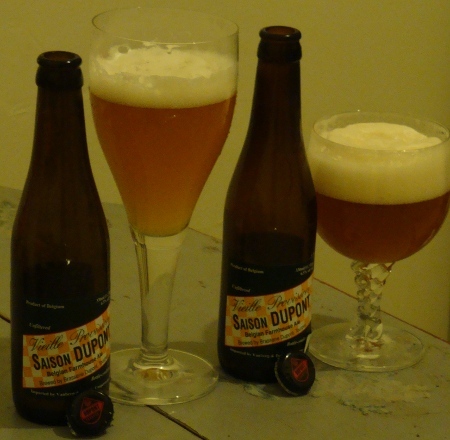 Saison Dupont pours an old gold color with a thick haze as well as a homogeneous distribution of tiny yeast particles. The off-white head is thick and moussey, and for the cellared version has a bit more stability. The change in the nose is intriguing. The fresh saison has a very light fruity nose of lemon and pear. Some malt and dry grass or hay come with it. The 2007 has a much darker fruit aroma. Raisins, cranberries, and figs stand out. There is just a bit of a malty sweetness before a funk sets in. I wouldn’t describe it as quite barnyard, but that might be only because I drink gueuze. There is just a bit of cider and some stinky cheese on the nose that remain too mild to be unpleasant. The fresh beer has a light flavor reminiscent of champagne. Clean malt flavor is paired with some dust and an assertive bitterness. Bread and some grassiness add complexity. A bit of fruit is there as well. The taste of the 2007 follows from the nose. The dried fruit and cider are prominent. Some malty sweetness and a bit of meaty (yeast autolysis) character. The fresh version has a light, refreshing body that stays dry. The bitterness and the lively palate make this beer drinkable but keep the character. The 2007 is somehow thicker and sweeter, with a lingering palate fullness. Two years is too long for this beer; I wish I had a 2008 to try. I decided to blend the last few sips of each vintage. They compliment each other quite well, with the 2007 providing a robust character and the 2009 making it sprightly. Next up, the organic saison Forêt. I looked it up: it means ‘forest’. Is it a suggestion not to miss the forest for the trees? You decide. It is important to note that when they say ‘organic’ they mean it. Exactly 100% of the ingredients in this beer are organically grown, unlike beers labeled ‘organic’ in the United States. Forêt pours a hazy golden fulvous color (yes I looked that one up, too). The creamy white head lasts forever, and there are a few of the same yeast specks floating. The aroma is just fascinating. There are little bits of so many things. A spiciness greets you at first: coriander, black pepper, anise, and cinnamon. This is followed by an herbal hop character that borders on floral. A clean pale malt aroma rounds it out, but the spices never give way. The taste, much like the nose, is spicy, yet so much more. An alcohol warming sets the stage. The black pepper and coriander are back, and sage and basil are quick to add an herbal contribution. A little bit of sweetness and clean malt flavor balance an earthy hop bitterness. This lasts just a moment, with the sweetness lingering a bit longer. This beer is eminently flavorful, refreshing, and quaffable. 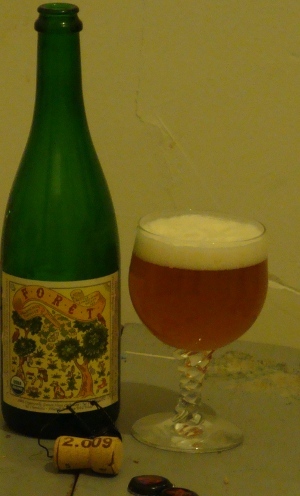 Without question Forêt deserves a place among the best saisons, be they organic or otherwise. Finally, the Avec les bons Vœux de la brasserie Dupont. The top of this label has the inscription “III”. Every bottle I have seen has this. I don’t know what this is or why it’s there. Please tell me if there is some story behind the three that I cannot locate. The Bons Vœux pours a lightly hazy coppery gold. The off-white head is thick and voluminous and seriously lasts. The nose is light and dirty. The sweet malt aroma is made interesting by a bit of barnyard funk and sweatiness. Some spiciness comes out, too. A spicy alcoholic flavor, a warming sensation, and a bit of ethanol flavor betray the nine-plus percent alcohol of this beer. It is almost hidden, however, in the spicy yeast flavors: coriander, pepper, mace, and cloves. A bit of sweet malt contributes a bready flavor. The earthy hops add a balancing bitterness that keeps the beer lively. Though thick and sweet, this beer is certainly refreshing and not at all cloying. The Bons Vœux would be essentially perfect if not for the pronounced alcohol character. This evening, after the family Thanksgiving celebration, Matt and I had a mini vertical tasting. This is when you open several vintages of the same beer and compare. We are both fans of the special reserve beers from Goose Island, so we’ve got a few still around from last year. Perhaps at some point we can do a vertical with Matt’s Matildas. Tonight we had a 2007 and a 2008 Goose Island Bourbon County Brand Stout. This is a serious imperial stout, probably weighing in around 10 or 11 percent alcohol, before it is aged in bourbon casks for several months, bumping it up to 13%. The story goes that every year when this one is bottled the Goose Island top brass comes around to the packaging line to ensure they get their cases. Bourbon County pours a thick hazelnut black with no head, just a few stray bubbles. Make sure you drink this out of a thin, clear, ideally stemmed glass, as it will reward you with an enchanting copper coating. The aroma is sweet and playful, with notes of black licorice, light oak, and some bourbon. The 2008 has a sharp alcoholic nose as well as something that smells like twizzlers. The roast aroma is more prominent in the 2007, which has an overall rounder, more robust nose. Bourbon and roast malt ride the egg-nog thick wave of this ale. Caramel, licorice, and some anise round out the flavor. The 2008 is again just a bit too boozy. 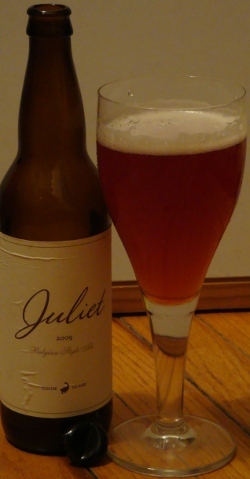 The palate is chewy and sweet but not at all cloying, and somewhat smoother on the 2007. Overall both vintages seem very similar. Where there are differences I attribute them to the varied fermentation of the beer in each batch rather than to aging. Somewhat more care was taken with the 2007 batch, and whether it was the fermentation or barrel aging, it did not pick up the unpleasant sharpness of its younger brother. Inspired by olllllo’s recent post on beerporn, I have decided to take stock of my beer cellar. Unlike olllllo I prefer to keep most of my beer out of the fridge so that it continues to age. Only the weakest and most unstable of beers should be kept refrigerated. Capital Maibock and an Autumnal Fire aged over a year by Jan of Steve’s Liquor! Rule: A good brewer has decent beer (other than their own!) to drink for themselves. Anyway, that’s not all the beer I have but I’m lazy and it can’t be all that interesting.